Naya Rivera‘s domestic battery charge has been dropped. The charge against the 31-year-old Glee actress was dismissed by the Kanawha County Magistrate Court’s office in West Virginia as of Friday (January 12), according to TMZ. The case was reportedly dropped because her estranged husband, Ryan Dorsey, does not wish to move forward with pressing charges. Naya was arrested back on Thanksgiving weekend in 2017 after Ryan called the police to report her for allegedly hitting him due to a dispute over their child. She then filed for divorce shortly thereafter. Naya Rivera is all smiles as she speaks on stage at the 2018 Winter TCA Press Tour on Saturday (January 13) at The Langham Huntington in Pasadena, Calif. The 31-year-old actress looked super cool in a sleeve-less band T-shirt, denim skirt, and thigh-high leather boots as she stepped out to promote her upcoming new YouTube show Step Up: High Water. 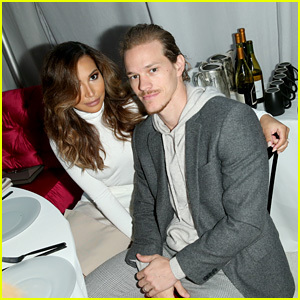 This is the first time Naya has made a public appearance since her Thanksgiving weekend arrest for allegedly assaulting estranged husband Ryan Dorsey. Naya Rivera and estranged husband Ryan Dorsey have come to an agreement regarding custody of their two-year-old son, Josey. The former couple will share joint legal and physical custody of Josey, according to The Blast. Naya filed for divorce from Ryan for the second time in early December after the two got into a reported altercation, during which Naya was charged with misdemeanor domestic battery in West Virginia. Pictured below: Naya goes Christmas jewelry shopping on Thursday (December 28) at 14 Karat in Beverly Hills, Calif.
Naya Rivera has filed for divorce from her husband Ryan Dorsey for the second time. The 30-year-old former Glee actress initially filed for divorce in November 2016, but she and Ryan later reconciled and then she dismissed her filing two months ago. Naya and Ryan got into an altercation over Thanksgiving weekend and it led to her being arrested for misdemeanor domestic battery. Ryan claims that Naya hit him in the head while they were walking with their two-year-old son Josey. Naya lists the separation date as November 24, one day before her arrest, according to The Blast. In the divorce documents, Naya lists the reason for the split as “irreconcilable differences” and she wants joint legal and physical custody of Josey. She also wants the judge to block spousal support on either side. Naya Rivera has been spotted out for the first time since being arrested over Thanksgiving weekend. The 30-year-old former Glee star tried to keep a low profile in an all black outfit and dark sunglasses as she ran errands around town on Thursday afternoon (November 30) in Los Angeles. Naya was arrested in West Virginia on Saturday night on domestic violence charges after she reportedly hit husband Ryan Dorsey in the head. Earlier this week, Ryan broke his silence for the first time asking for privacy and respect. Ryan Dorsey is now speaking out following the arrest of his wife, Naya Rivera. The 34-year-old actor posted a statement on his Twitter on Tuesday (November 28). Naya was arrested on Saturday night (November 25) in West Virginia for a domestic violence incident involving Ryan.